Marc Weidenbaum, it’s fair to say, is a kind of a pillar of the online experimental community. In addition to being an ambient musician, sound artist, teacher, and writer, Marc is founder and organizer of the Disquiet Junto. Each week since 2012 this online group has uploaded hundreds of tracks, each a unique interpretation of a particular challenge outlined by Marc and delivered to an email list of 1,100+ participants. The intent behind these assignments, according to Marc, is “to use constraints to stoke creativity.” As counter-intuitive as that might seem, there’s evidence to suggest it works. So, “what are some of these assignments?” You’re probably wondering. Some are specific: create an animal duet using samples from two different animals. Some are a little more vague and conceptual, like “what is the room tone of the internet?” Many encourage collaboration or remixing. Some mark anniversaries or honor someone who has passed, like the recent dual assignments honoring the late Bassel Khartabil, a Syrian open-source software engineer. This week in fact, marks the 300th week of the Junto, so it seemed like a fitting week to publish an interview with Marc I had over the summer. Caliper(C): I guess I’ll start with something I’m always interested in: who are your influences, both musical and otherwise? Marc(M): That's a hard question for me to answer. There's so much accumulated musical experience, and I don't have the list-maker gene. I don't really have top 10 favorites of things like movies or TV shows, for example, and I also go through a healthy spell of killing my artistic heroes, of thinking through all the stuff about their work that doesn't appeal to me so I don't fall prey to idolization. I initially made a long list to answer this question, and then it just didn't seem to be fruitful. The best I can do is write some names down of people who at this very moment come to mind: Brian Eno, for his thought-provoking work in blurring the realms of foreground and background sound, and also in generative art; Pauline Oliveros, for her exploration of Deep Listening; John Cage, for the sense of humor, childlike curiosity, and zen patience he brought to artistic abstraction; John Zorn and Billy Childish, for pushing hard outside the system long before the system was visibly threatened; Kronos Quartet, for their ceaseless pursuit of collaboration; David Hidalgo, Louie Perez, DJ Krush, Scott Tuma, and Jon Hassell for their interests in merging old and new musical traditions; Rick Rubin, for his ability to connect with musicians without himself having a signature sound; Christina Kubisch, for revealing the sounds all around us. Ask me next week, and some of the names will change, but the impulses they track to will remain largely consistent. I think in all those cases, I'm referring to something extra-musical, not just to musicians and artists whose work I like to listen to, but musicians and artists whose work has a conceptual fortitude that is inspirational. And they've all been around, or were around, a long time, which also speaks to their fortitude. I have to say, I get an enormous amount of inspiration from the Junto participants. There have been far too many to name in detail, but at this juncture, a bunch of names suggest themselves to me: from early on, Brian Biggs, Stringbot, and the late Jeffrey Melton (aka Lofi), as well as C. Reider, Mystified, and Jason (Bassling) Richardson; also Naoyuki Sasanami, Ted Laderas (the Oo-ray), Rupert Lally, Ethan Hein, Marcus Fischer, Stephen Vitiello, Jimmy Kipple, and Peggy Nelson; and more recently Mark Lentczner, Erica Nesse, and Jason Wehmhoener, among numerous numerous others. It feels awkward to just name a few. Think of those as tips of a very large iceberg. C: Where did the idea for the Disquiet Junto come from? M: The Junto began as a single instance, an experiment. I had no idea if anyone would participate. It didn't begin as a series, per se, because I didn't know if anyone would even join in the first one. I had some ideas about musical activity, drawn from my work as a writer about music, and also as someone who occasionally had collaborated with musicians. My main collaboration with musicians prior to the Disquiet Junto was a series of free online albums I put together in which I'd ask some musicians to create tracks related to a specific topic, like remixing stems from Brian Eno and David Byrne’s My Life in the Bush of Ghosts, or coming to the defense of a sound artist disparaged in a major newspaper. In the process, I came to believe that the musicians' efforts benefited from certain aspects of what had been going on, things like the creative constraints inherent in the "assignment" I had proposed, and also the collegial if loose-knit relationship between everyone working simultaneously. C: Was there interest at first? How many members were there initially? M: I think the first Junto had somewhere between 45 and 60 entries. I don't really recall. I should probably do a more thorough accounting of the many hundreds of musicians who have participated over the years, but part of my approach to the Junto is to not track it too intensely. We live in a time of hyper-quantified cultural activities, and I’m cautious about its application. I was really heartened by the initial response. I felt like I'd put myself out on a limb a bit, and it was exciting to learn I wasn't out there alone. C: I have kind of a funny admission. Before the Disquiet Junto, I actually tried to organize something similar but in “real life,” so to speak. It failed pretty miserably. I guess I was the only weirdo in my friend group interested in this sort of limitation based thinking. Do you think the Junto would be possible offline, or is it a testament to social media’s ability to facilitate niche groups? M: Oh, definitely it could exist offline. Fluxus and Oulipo are examples of constraint-based artistic movements that flourished before the popular rise of the Internet. Mail Art would count, too, though it was by definition geographically distributed. I think with music in particular, a dense city would be useful for an offline equivalent. I have thoughts about doing Junto (and, more generally, Disquiet-related) live things in San Francisco, where I live, but there are only so many hours in the day. We did one show back in 2012, the same year we had Junto concerts in Chicago, Denver, and Manhattan. We’ll be doing more in the future, for sure. It’s helpful to keep in mind that the origin of the word Junto was an in-person organization of like-minded people that Benjamin Franklin put together in the late 1720s in the city of Philadelphia. C: Soundcloud played a big role in the Junto’s initial growth. In light of SC’s perrenial money troubles, are you optimistic about the future of the Junto? M: I'm optimistic, certainly. We're working at sorting out plans. The unfortunate SoundCloud situation has been a welcome kick in the pants. There are a lot of potential directions, and a lot of Junto people are pitching in on thinking about how to manage it. I'll say that in terms of a "post-SoundCloud" future for the Junto, I'm much more focused on a platform-agnostic situation than I am in one where we just trade one SoundCloud for another. C: Do you take SC’s potential decline as a sea change or the exception to the rule? In other words, are social music sites in the vein of SC still relevant? M: I think of "social" as an aspect not as a foundation. I think many web services, from message boards to the comments on blog posts to mail discussion lists, have social components. Just wanting to socialize online is like trying to survive on ice cream. Now, lots of people may find the concept of living on ice cream to be both a terrible metaphor (which it is) and a dream situation, but I'm not sure I'd put much stock in it. I'm less interested in "social music sites" than I am in music sites that have a social component. I'm fascinated by the limited social component in current streaming services, for example. There's so much opportunity there. C: Changing gears a bit, thinking about all the weekly challenges over the years, is there one that stands out as the most interesting, productive, etc.? M: No single one stands out to me. I'll say the ones that let the Junto members collaborate with someone outside the Junto (like when Brian Crabtree of Monome proposed one, or when we did a soundtrack for a short story read by novelist Richard Kadrey using his own voice as source material, or working with field recordings at the behest of Kate Carr, or when we've worked with architectural thinker Geoff Manaugh) is always exciting. I welcome more of that. C: How do you manage to keep the weekly challenges fresh? M: I come across things every day that I think may make good Junto projects. Like, a friend used a phrase recently to describe a kind of light effect, and I think we'll probably do a Junto project that tries to see what the sonic equivalent of that effect would be, how that effect experienced as a metaphor would apply to sound. I use text-to-speech services quite a bit, and one day I was listening and I noticed a few phrases had unintentional rhythmic components. That led to a project where we created text specifically to use the resulting rhythms as the foundations of tracks. It's endless, the opportunities to create Junto projects from observations about how sound and music function. C: Which do you think produces the best results: following the challenge guidelines strictly, or breaking the rules? M: I think it's best to follow the guidelines strictly, but I certainly have nothing against people who break them. I think it's great that people break the rules, so to speak. I learn from the changes they implement. C: What’s your favorite sound? M: I tend to think of sound in context, not alone. I teach a course about the role of sound in the media landscape, and I structured the course that way because I didn't want to do a sound studies project that suggested that sound must be considered in hermetic, theoretical isolation. The brain isn't an anechoic chamber. If anything, it's the opposite. If anything, we as humans are the opposite. Sound occurs in the context of the moment it resounds, in the way we experience it physically, and also amid the non-linear accumulation of personal and cultural associations it brings to mind. All of which said, if I had to choose one sound as a favorite, it would be the sound of ice in a glass. That is, specifically the sound of ice cubes put in a cold beverage, and especially when those cubes crackle and pop as they ever so slowly change composition. That sound is the subject of the very first Disquiet Junto, when I asked musicians to record the sound of ice in a glass and make something of it. It was already a sound I liked. I drink a small glass of iced coffee every morning, always with a couple ice cubes in it. But because of what the Junto has become, that sound has become rich with personal meaning and associations, which have in turn reinforced it as a favorite, as a true touchstone. When I did the first Junto project, that sound was the subject of it because I liked the sound. Now every morning when I drink iced coffee, I think in turn of the Junto. “There’s nothing new under the sun”, so goes the rather discouraging adage. Artists and musicians have been trying to disprove this saying for some time. Whether or not there has been any success in that department is up for debate. In the late 70’s and early 80’s there came a new avant-garde ethos rising out of the punk movement. It went by many names: new musick, post-punk, no wave; but the desire to shed what artists saw as the tired tropes of punk was much the same. 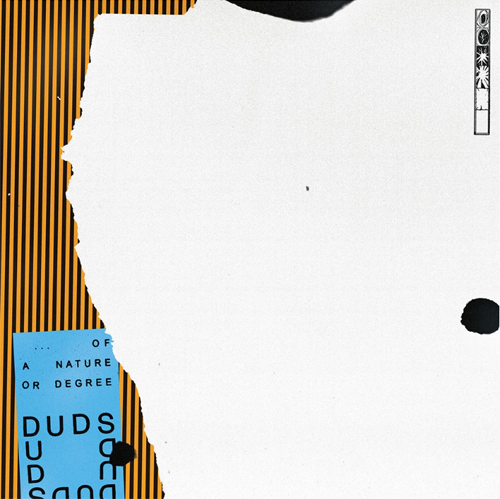 Fast forward to present day Manchester where a new post-punk band, DUDS, is impressing listeners and show goers with their pursuit of that post-punk dream. Their new album, Of A Nature Or Degree was just released on Castle Face Records and it’s filled with atonal guitar riffs, rhythm patterns that are both odd and visceral, as well as some funky grooves to break up the controlled chaos. As you’ll notice, there is a definite affinity for classic post-punk, no wave and experimental rock, but also some resistance to any such categorization. One of the first holdovers from punk that you’ll notice is speed. The beginning of the album feels kind of like a caffeine overdose turned into music. Some of the pieces are also quite short, the shortest, “A Different Stage,” coming in at just 33 seconds. Not all tracks are frenetic, however. Pieces like “Elastic Seal” later in the album slow the pace down a bit, with a cool groove. A bent guitar string, acting as a metronome, playing simple quarter notes proves you don’t have to be complex to be weird. It’s also more in-key than a lot of the album (quite catchy actually). It eventually descends into tonal and rhythmic chaos, but it’s down right funky until then. The consonance isn’t alone on the album but it stands in contrast to the opening “No Remark,” “Signal, Sign,” “Of Nature,” (take your pick, really) where guitar and bass seem to have a tonality all their own. “Elastic Feel” features wild, James Chance style saxophone improv to finish the song off. “Signal, Sign” is interesting because of the simple yet strange two chord progression reminiscent of Wire. It’s also got a perfectly dark, not quite dissonant bridge that carries the song out. Another call-back to original post-punk era is “Irregular Patterns,” which features a classic drum machine with a guitar tone that would sound right at home on a Gang of Four record. In all these pieces the bass, although it echoes the crazy guitar melodies, seems to provide a foundation for the chaos. It would be hard to rock out to some of these pieces were it not for the revolving bass riffs. The paradox of DUDS, and perhaps of the post-punk clothe from which they are cut, (some writers on the subject have pointed this out) is that in the pursuit of something new, an inevitable, eclectic borrowing is bound to occur. Bands of the classic post-punk era retained punk’s rebellion and DIY spirit while delving into other genres such as funk, electronic, dub, reggae, noise, and jazz in pursuit of a new sound. Now, nearly forty years later, DUDS, in their own explorations, perhaps are refining and codifying the results of this initial post-punk experiment. In other words: a copy of an eclectic copy. It's also doubly ironic because they are turning something that was arguably anti-style (e.g. “no wave”) into a style. Over the years, there have been plenty of bands donning the post-punk moniker posthumously that are responsible for this refinement as well. It’s also not the only “genre” that didn’t start as such (think of the original meaning of “indie”). As far as rhythm, the occasional odd time signature, or polyrhythm bucks any comparison to the 4/4 standard of most punk and post-punk drumming. “No Remark,” a re-recorded track from their earlier EP, Wet Reduction, has a bizarre four and a half beat riff. The simple opening guitar line almost mocks the simplicity of a 4/4 beat, lingering just a little too long on the last note. The atonal break down mid-song ending with a couple of clicks of the woodblock is a perfectly quirky reset before getting back to the ecstatic groove. “The Nose” is an intense piece with obtuse timing. The three notes at the end of the riff prevent you from rocking out, instead forcing you into a sort of rhythmic spasming that’s probably more fun anyway. Much of the seeming chaos on the album can be explained in musical terms if you know what you’re talking about, rather than free form, Beefheart style expressionism. An impressive exception is “Pro Tem” which slips in and out of a disorderly spoken word break-down with ease. Throughout the album there is various arrhythmic improvising on top of a more regular foundation as well, an attribute more common perhaps to the no wave scene than to post-punk. The album is available on CD or Vinyl through Castle Face Records.